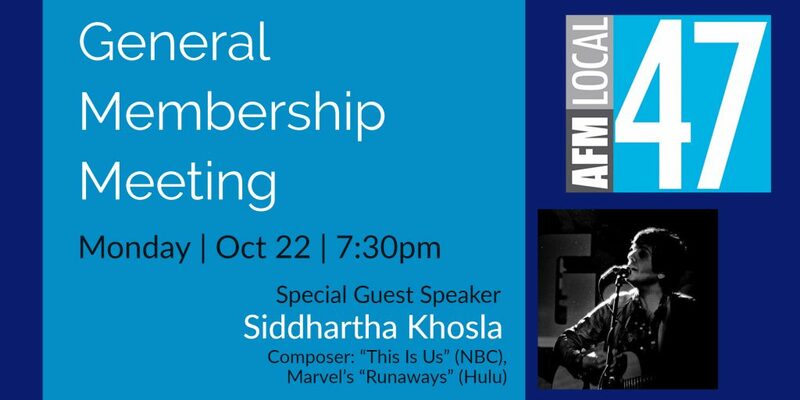 At our Fall 2018 General Membership Meeting we are excited to welcome composer Siddhartha Khosla as our special guest speaker. He will talk about the process and showcase some of his works from hit TV series “This Is Us” (NBC) and Marvel’s “Runaways” (Hulu). Don’t miss it! Open to all members in good standing. This entry was posted in All News, Events and tagged general membership meeting, Siddhartha Khosla on October 1, 2018 by admin. “Momentum is strong, and we can’t let up now!” That was the dominant message on Saturday, Aug. 19 at the “Keeping the Score in CA” free concert and rally at city hall where a crowd of 150 gathered to hear music, politicians and union leaders push for the AB 1300, the music scoring tax credit that will help keep good jobs in California. “When you look at the overall state budget, the value of retaining these jobs here is of significant state interest,” Assembly Majority Leader Ian Calderon (D-57th), told the crowd who gathered to hear performances by musicians including Rickey Minor (bandleader for the 69th Annual Emmy Awards whose credits also include “The Tonight Show” and “American Idol”) and Siddhartha Khosla (composer for NBC’s “This Is Us”). This entry was posted in All News, Legislative News and tagged AB 1300, Ian Calderon, Keeping the Score in CA, Keeping the Score in California, KTS, KTS press, music tax credits, Rickey Minor, Siddhartha Khosla on August 29, 2017 by admin. 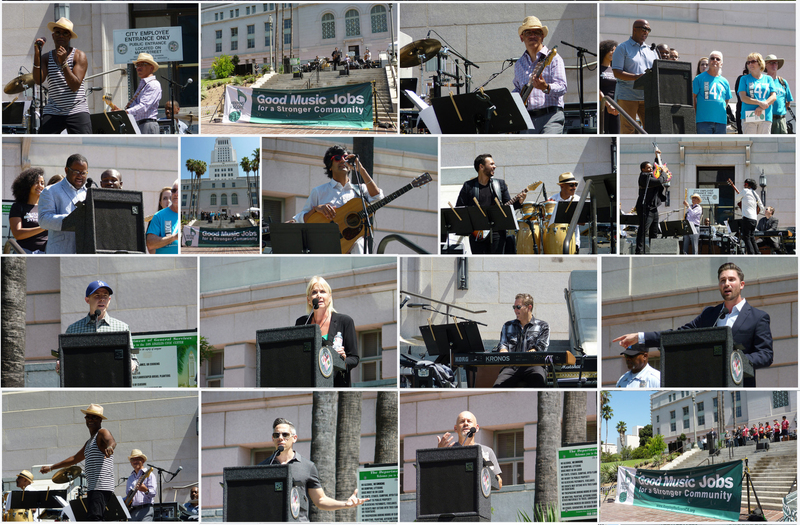 LOS ANGELES, CA (August 16, 2017) — Los Angeles film and television musicians will perform a free concert at City Hall on Saturday, Aug. 19 to raise awareness of AB 1300, the Music Scoring Tax Credit Bill aimed at bringing back more of the entertainment industry’s scoring and composing work to California. 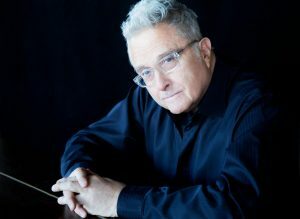 This entry was posted in All News, Press Releases and tagged AB 1300, Keeping the Score in CA, Keeping the Score in California, KTS, Randy Newman, Rickey Minor, Siddhartha Khosla on August 16, 2017 by admin. 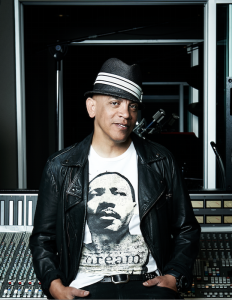 LOS ANGELES, CA (August 3, 2017) — Los Angeles film and television musicians will perform a free concert at City Hall on Saturday, Aug. 19 to raise awareness of AB 1300, the Music Scoring Tax Credit Bill aimed at bringing more of this work to California. This entry was posted in All News, Events, Press Releases and tagged AB 1300, American Idol, Keeping the Score in California, KTS, Music Scoring Tax Credit, Rickey Minor, Siddhartha Khosla, The Tonight Show, This Is Us on August 3, 2017 by admin.